Yep, I've missed this by 10 pips too (should have used the 200MA and 102.12 support as my mark and then added spread). I've also missed closing my USDJPY short by less than 10 pips and my long order on EURUSD by less than 10 too. Very annoying. its bounced about 9 pips from my entry. I do hate this when i get so close yet so far. oh well.Ill catch this another day. Please bear in mind trend line entry levels change every day. Last Edit: 06 Nov 2012 10:26 by remo. i always look for minimum of 3 times my stop loss. If possible 4 times. with regards to stop loss . I tend to give myself a wider stop loss as have been bailed out to much when i go for small stop loss but if the level is perfect then small stops can be done. On currency and indexs i find that a bigger stop loss normally helps over the long term as long as the risk reward is 4 times as much as the stop. Thanks for clarifying that remo. Trading timeframe is an important and often overlooked element of success. We talk a lot about entries too, but perhaps not enough about exits/targets. Anyway, I'm sure you're right and there'll be a bounce there - supports and resistances are a lot more reliable than EWT for trading from but I still think that a bounce there will be fairly short-lived so I'd be looking to exit no higher than the downtrend line which I have at 103.911 today (falling daily) or a Fib retrace of the last mini-drop - just a classic exit at resistance I suppose. Your 3 contract method certainly helps overcome the issue of when to exit too. Hi gang, just popping in for 5 mins. Remo, i dont have decent charts with me, but i would say that yo dont need to risk 30 points on this trade, to make it a good trade 15 points risk looks like the play. What sort of proffit are you looking at ? KI. My aim is to catch the initial bounce then start to take profits. I always place a trade at known supports and trendlines on first attempts. I find it the best way to make a quick profit. I actually keep it very simple. It looks to me like it's completed 5 waves up on a bearish RSI divergence which was tested and held during the subsequent lower high. 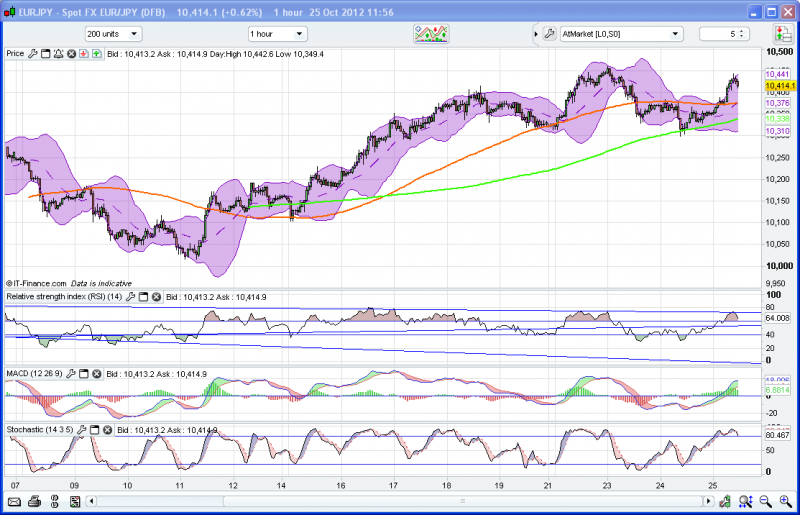 Also, if that RSI breaks down before the price then that suggests weakness. I could be wrong of course, but I think I'll wait to see if it comes back to the 61.8% Fib of the whole move up as there's also strong support from the 97.8 area. 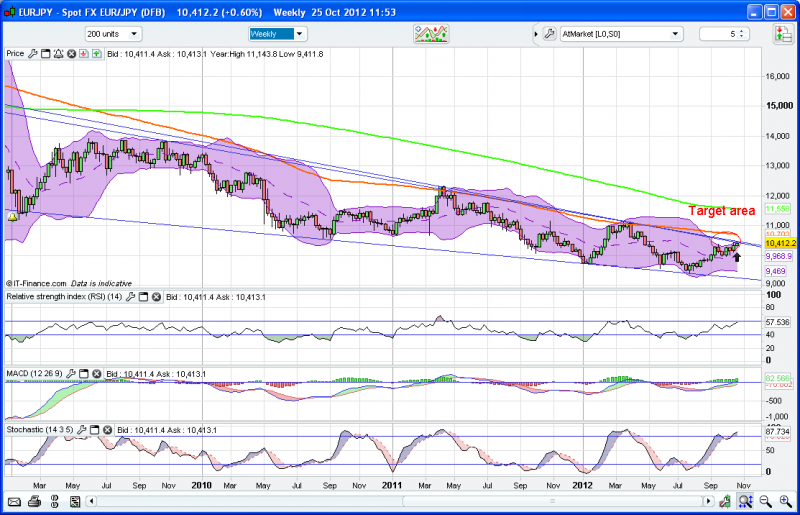 The main up trend line is at 101.94 and the 200sma is at 102.09 so thats 2 levels of support close together. It has certainly found reverse now. Broad-rock, they look OK to me. We've got 3 levels of resistance: 61.8% Fib retrace of last drop, main downtrend resistance and resistance from previous support at the hammer on the 16th April low. If it closes here for the week then there will be a shooting star on the weekly chart too. I'm just a little surprised it hasn't reversed quicker but that may be due to it being short of resistance against the USD. Perhaps a bit like FTSE trendlines and S&Rs being a bit vague until the Dow makes them more decisive? Stop would probably have to be outside 104.595 recent high. Will be interesting to see how it goes as it doesn't seem to have sharply reversed from that level. Yea, I would like to see another test and fail on that RSI trendline without the price breaking the trend by a chunk. Im sideline at the moment anyway and not trading so these are just for fun and keep the brain sharp. I done these yesterday, similar, but would like your take on the fib levels please Jackozy. Certainly looks to be topping on the 1HR timeframe too. Nice divergence and trendline correspondence on the RSI - in line with the bigger timeframe resistance. Last Edit: 25 Oct 2012 12:00 by gclark25.